Well, of the last few months anyway. 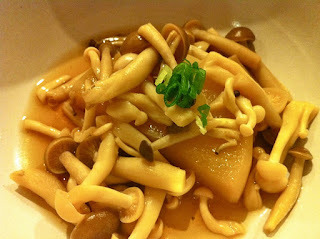 There have been a few truly memorable drinks and eats in the past months that I never found a way to write about here. So I'll compile them in a best-of-the-unposted list from the last part of 2011. 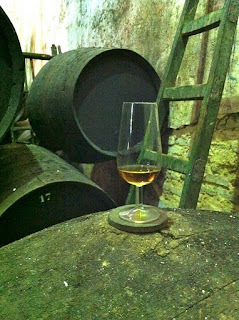 I was in Jerez in October, and one night I had dinner at La Carbona with Peter Liem and Eduardo Ojeda, the cellar master at La Guita and Valdespino. Eduardo brought several ridiculous bottles to this dinner, one of which was a bottle of La Guita Manzanilla Pasada...but from the mid 1970's! 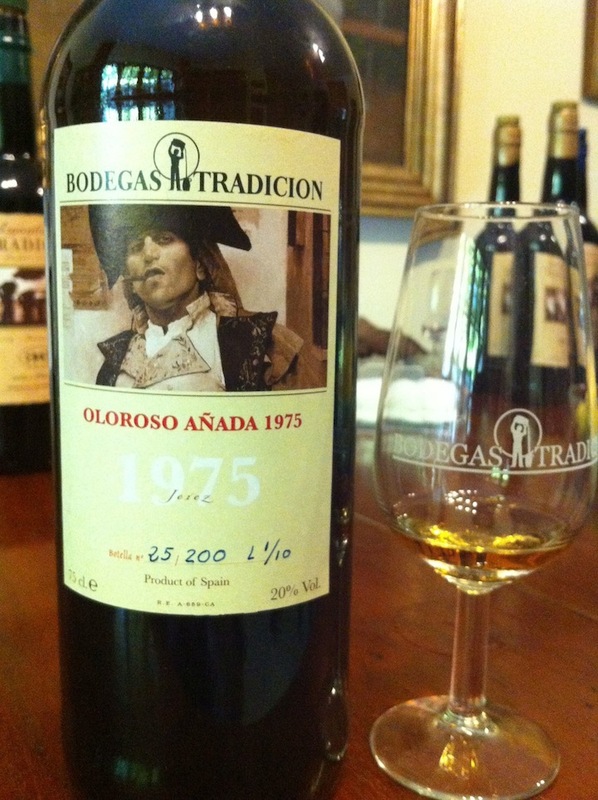 That's right, a Manzanilla Pasada that had spent the past 40 years in bottle. 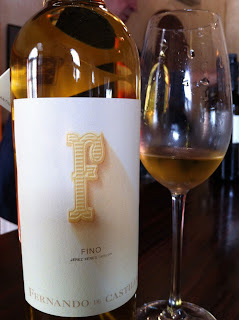 I'm telling you, the idea that Fino wines cannot age is simply wrong. 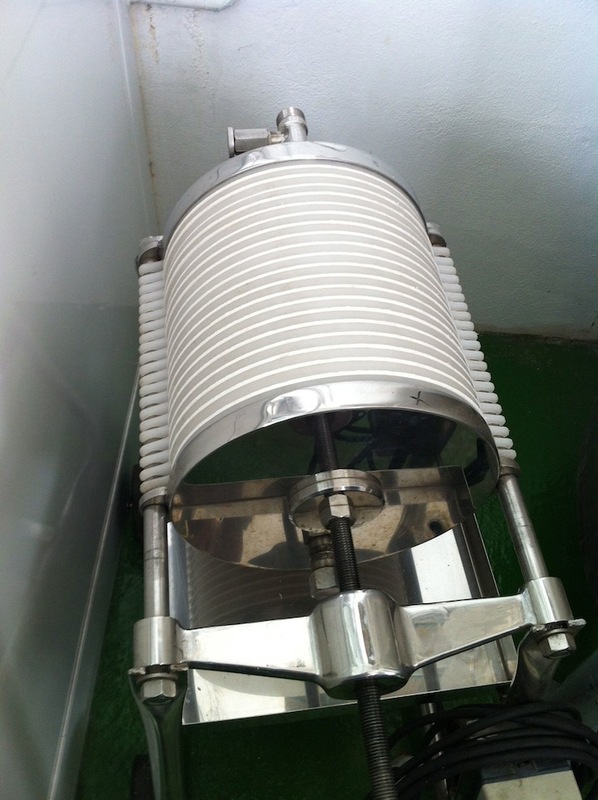 When they are well made and stored properly they can be wonderful. This wine was stunning in its complexity, and also in its freshness. We drank it with a perfectly grilled bone-in strip steak (I think that's the cut, anyway - you butchers out there can correct me based on the photo if need be). 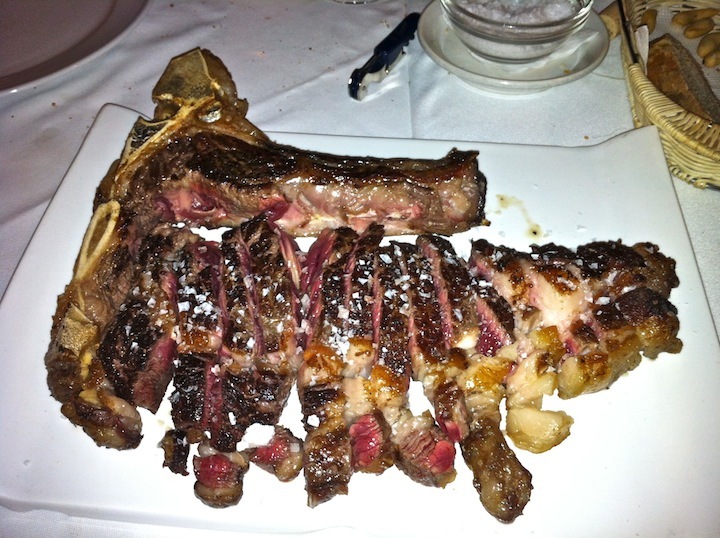 This steak would fare well against anything served at steak temples in NYC - seriously. And La Carbona is by not even a steakhouse. The pairing was fantastic - the umami depth of the wine complimented the meat and the freshness of the wine enlivened and cleansed the palate. An experience I must repeat at some point. 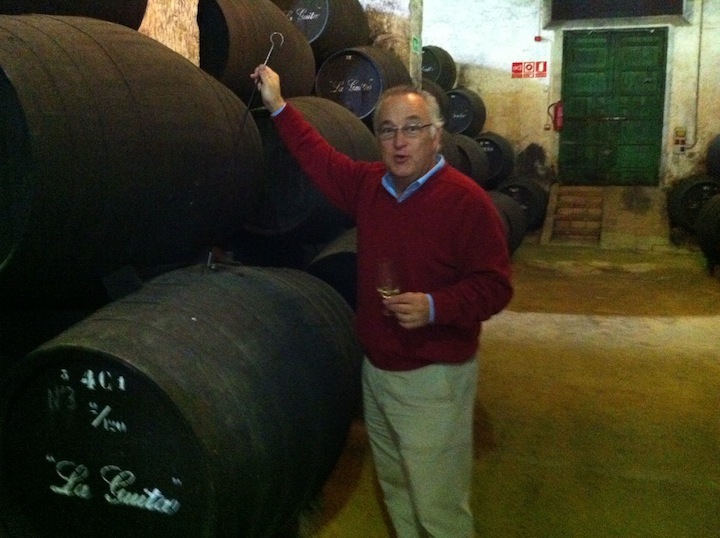 And more Sherry...Joe Salamone was also in Jerez in October, and he returned with a very fine bottle that as of now is unavailable in the States, a special Palo Cortado from Gutierrez Colosía, the very fine producer in El Puerto de Santa María. The average age of these wines is at least 40 years and the wine is a complexly concentrated elegant thing of finesse and beauty. 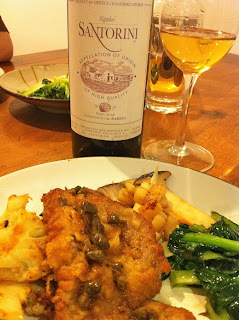 We drank this wine with home-cooking style Japanese food. 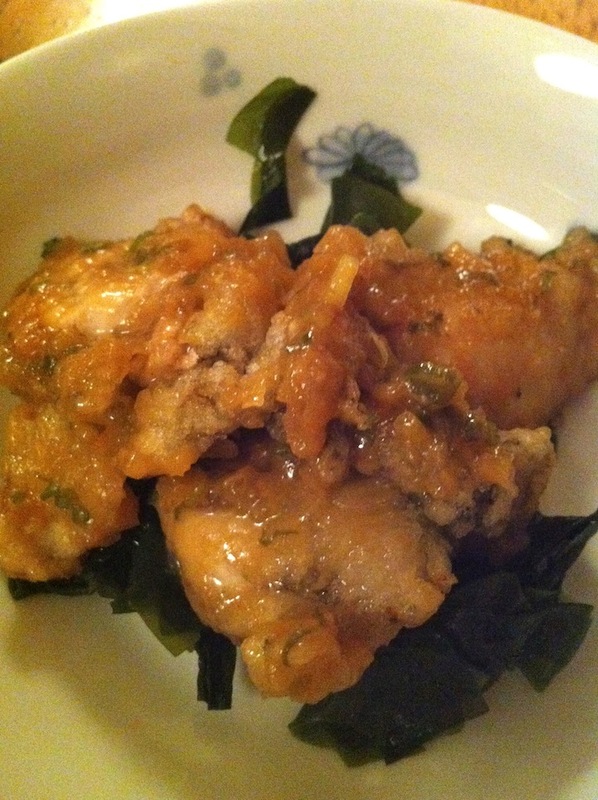 It was great with everything, but drinking it with these fried oysters with miso and seaweed was among the most thrilling and delicious pairings I experienced all year. Savory briny sweet complex harmony. I ate dinner with a few friends at Prune in the fall, and one of them drove in from Rhode Island with several absurd bottles in tow, one of which was the 1972 Leroy Gevrey-Chambertin 1er Cru Lavaut St Jacques. The wine was closed down hard at first, not so unusual for a wine that's been under cork for the past 40 years. 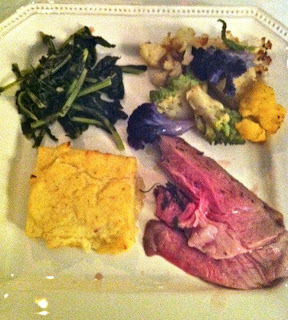 But it opened up and showed beautifully, with savory earthy tones and even a bit of very gently stewed fruit. Such a great treat, to be able to drink a majestic old wine like this. We ate all sorts of good things at Prune, and I am not sure, but I think we drank this wine with lamb sausages and all of us were swooning. 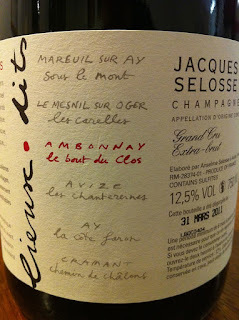 Peter generously brought a bottle of Selosse Champagne from France for my birthday in the fall. 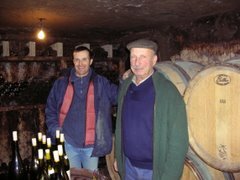 It is a new release called La Bout du Clos, a wine made entirely from that same vineyard in Ambonnay, from the 2004 vintage. 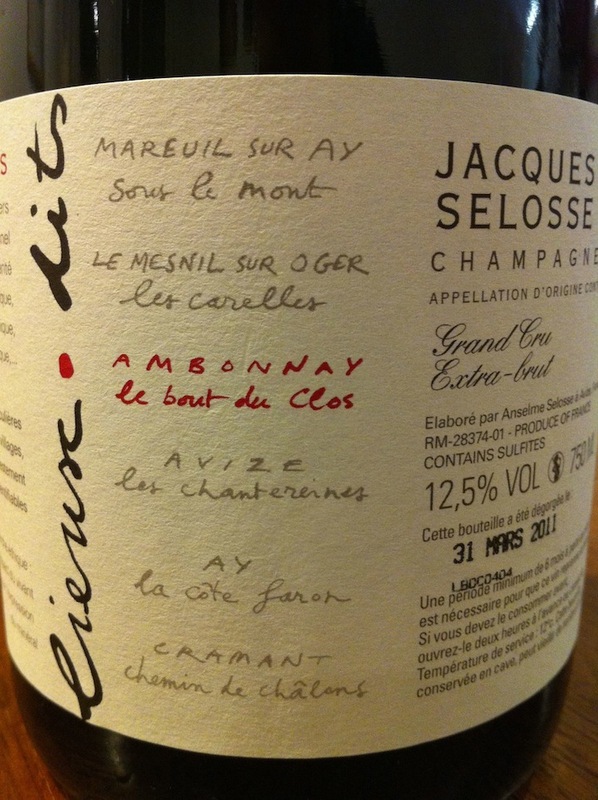 This wine was a bit more quiet than other bottles of Selosse that I've experienced, the oxidative streak not as strong, the supple fruit and saline minerality of the wine doing the talking. It was a special treat. Peter made a lovely dish of Champignon mushrooms and daikon radish simmered in dashi to go with it - a perfect harmony of savory flavors and aromas. 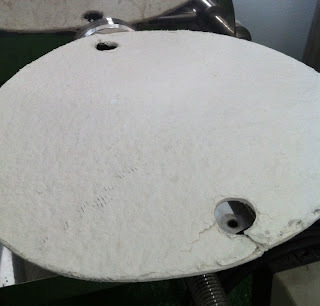 And a concrete reminder, if we needed one, that Champagne is a great table wine. 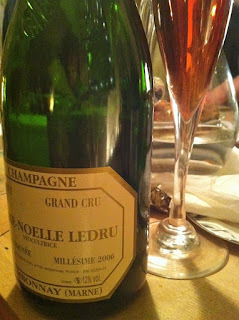 Why, on Christmas eve my friend Dan Melia opened an absolutely gorgeous bottle of 2006 Marie-Noëlle Ledru Saignée Rosé, and we drank it with excellent grilled cheese sandwiches and various pickles. An unusual pairing, maybe, but Champagne is great with fried food, and the pickles didn't intrude at all. Ledru's Saignée is so very vinous, it's like drinking red wine that happens to have a few bubbles. The wine unfolded slowly and gracefully and was best right as it vanished, a compelling merging of fruit and mineral concentration with textural finesse and grace. 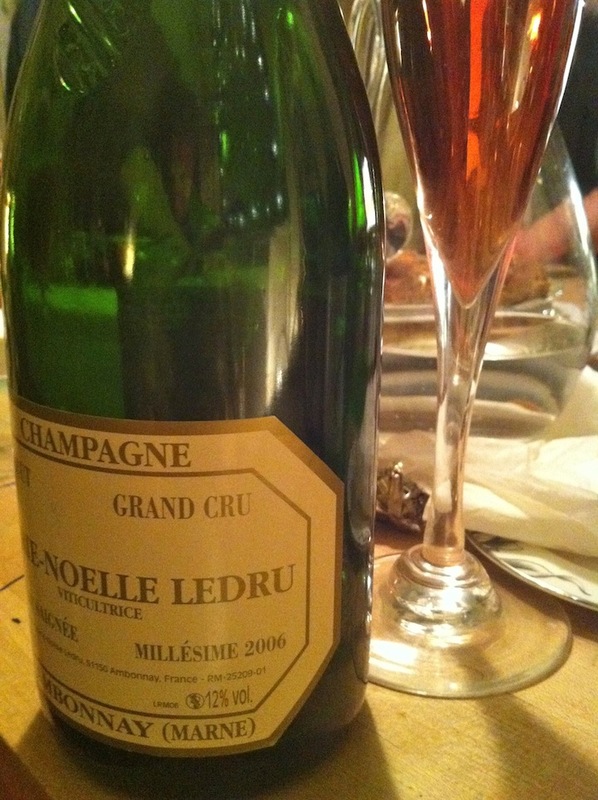 Note to self: buy everything Marie-Noëlle Ledru makes before she stops making Champagne. 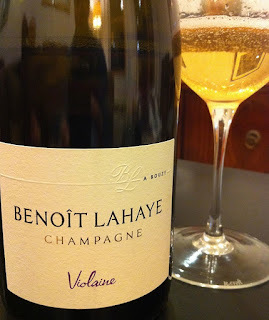 I've never had Violane before, the sans-soufre cuvée by Benoît Lahaye. This bottle comes entirely from 2008 and is a blend of equal parts Pinot Noir and Chardonnay. I love Lahaye's wines, I love their clarity and focus, their delicate yet powerful expression of Pinot Noir from Bouzy. 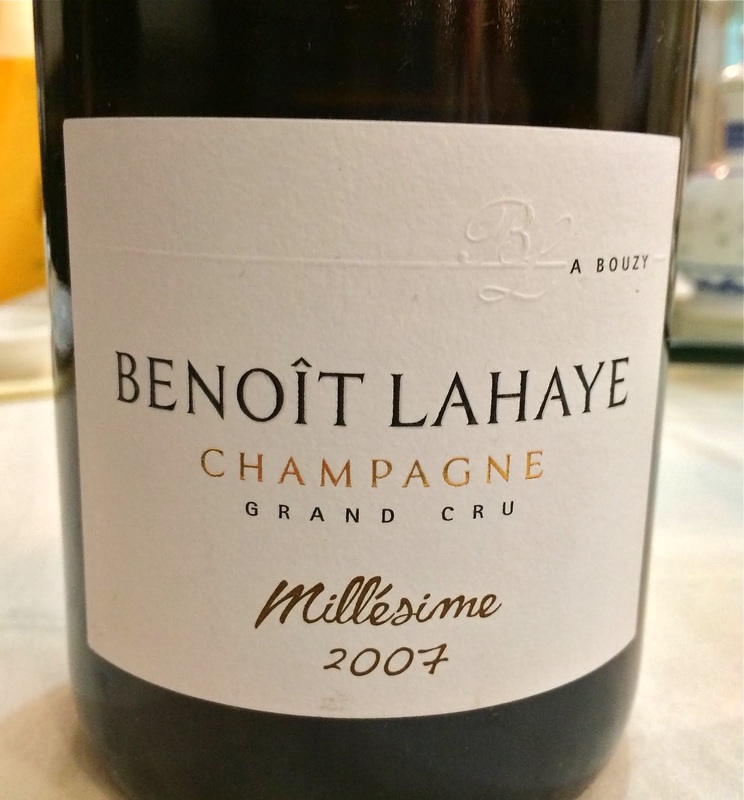 I loved this wine too, although it is definitely different from the other Lahaye wines I've had. First of all, there is no sulfur, and the wine shows an oxidative undertone that frankly reminded me of some of the Selosse wines I've had (yes, the wine is that good). There is an intense concentration of fruit aroma and flavor and the finish never really ends. 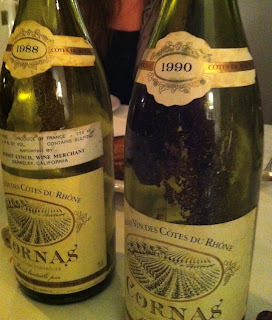 We drank this wine on its own, and it was a wonderful pairing. I am drinking the dregs on day two as I write this, and gnawing on a piece of country wheat bread, and it is good. I haven't had a wine from Santorini in over a year now, as after an initial love affair, I had a group of wines that showed too much sulfur and not enough deliciousness, and I kind of retreated. Not sure what I will do now, after this wine. Peter and I were trying to decide what to drink the other night with a dinner of breaded and fried veal cutlets, cauliflower with cumin, king oyster mushrooms, and garlicky greens. 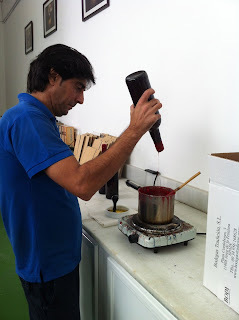 He saw a bottle of 2007 Sigalas Barrel Fermented Assyrtiko in my wine fridge and asked that we open it. I would never have picked that wine, and wow, was it a great pairing. We decanted the wine about two hours before drinking it, and it was fantastic. 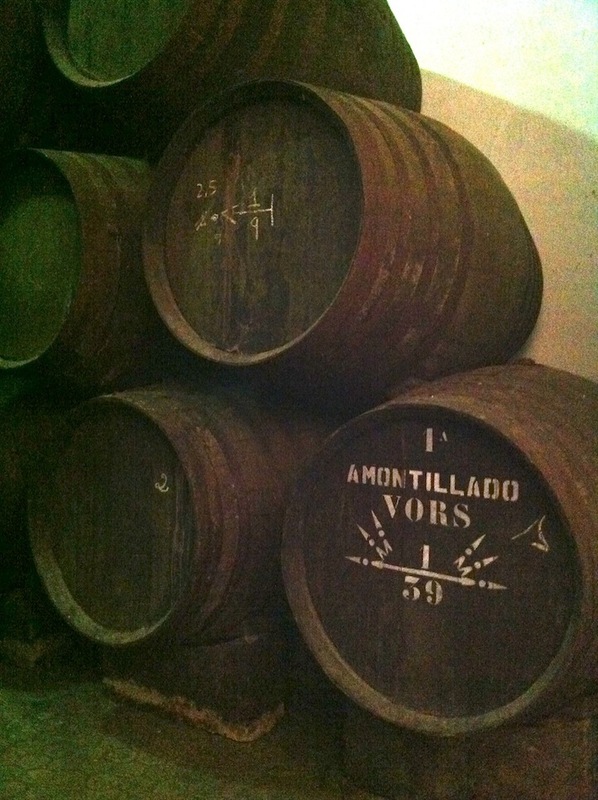 The aromas were clear and fresh, vibrant. 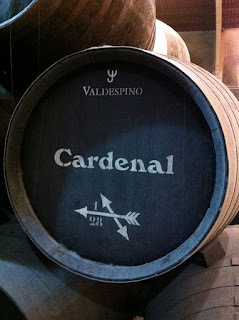 The wine has a unique aromatic profile, and now that it is maturing, it is articulate and detailed. For me the primary aroma is pumice - the volcanic rock. 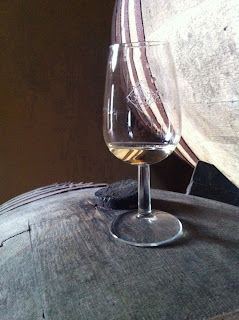 There is citrus fruit too, something floral, a Burgundian barrel-influenced sweetness, and all infused with this lovely slightly smoky savory-ness. 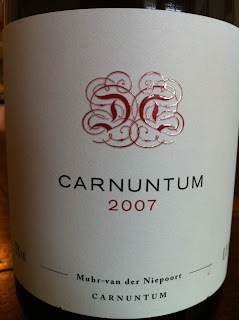 Great freshness and acidity on the palate, balanced, and expressive. 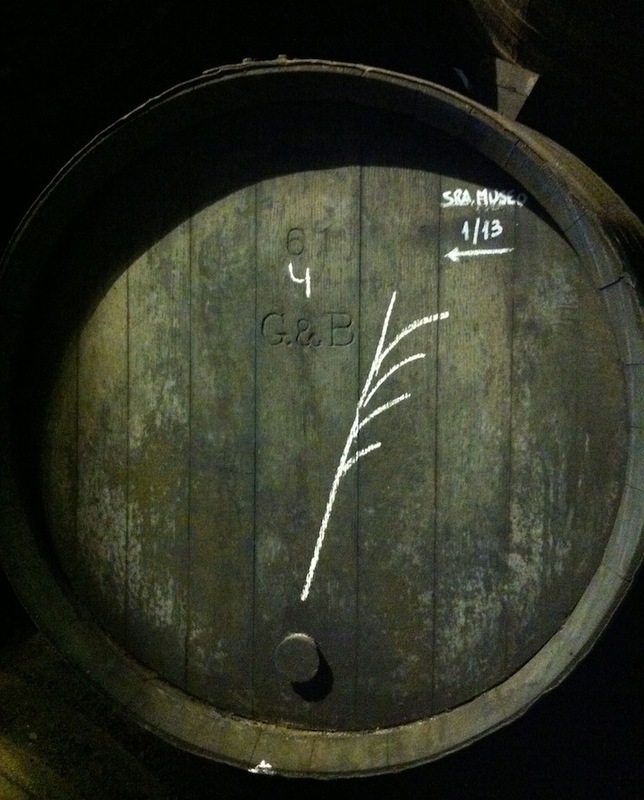 Simply delicious wine, and seems like its only beginning to grow into itself. The wine went so well with the veal cutlets, which I topped with a little deglaze of butter, lemon and chopped salted capers. 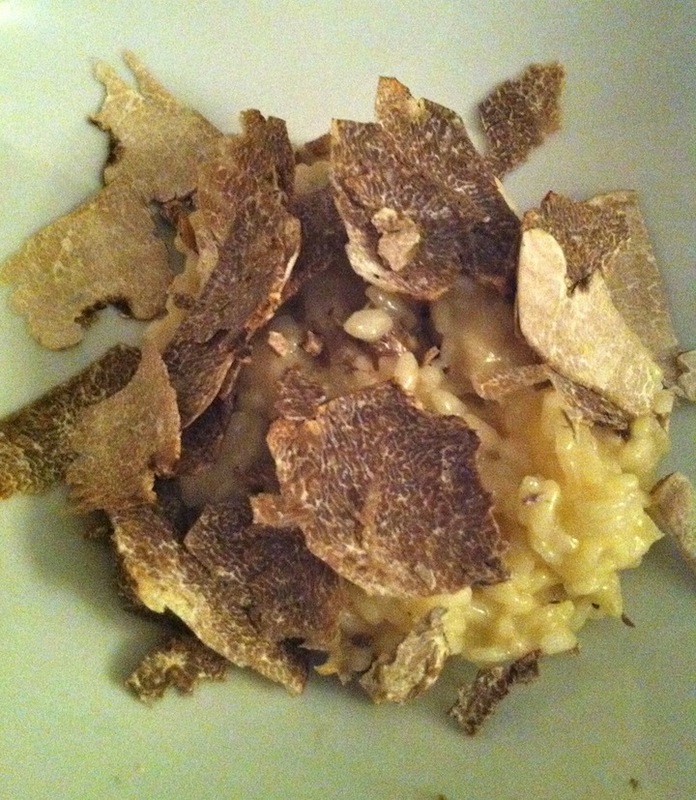 It worked with the earthy cumin notes of the cauliflower and the savour of the mushrooms too. 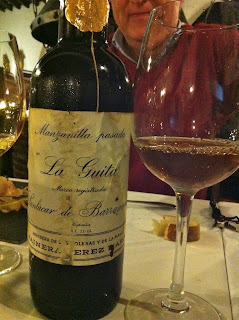 It was surprising to me how this wine offered enough richness to pair with everything on the plate, but also the brightness and refreshment to balance the meal. This last one reminds me, as a new year approaches, of the value of being open minded, of welcoming new experiences, of being informed by and considerate of what I've learned to be true, but also of wanting to be wrong about things - of learning continuously. I hope that your 2011 ends in a lovely way, and that our 2012 is filled with happiness and learning and many exciting new pairings. Some recipes and techniques I like to keep to myself. I have to have something to impress you with if you come over for dinner, right? But some are so simple and so great that it becomes my civic duty to share. Here is one, a new one for me - a technique for cooking babyback ribs without a smoker or a grill. Honestly, it's as simple as it gets and total time is under two hours. Please address appreciative correspondence to: Brooklynguy@thankyouribsBrooklynguy.gov. 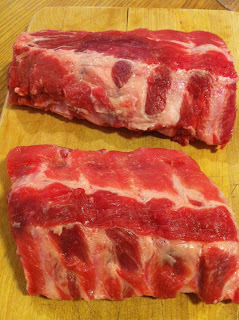 Start with good quality ribs. I've tried both spare ribs and babyback and both come out great, but my kids can handle the smaller babybacks more easily, so that's what I go with. Put the ribs in a pot and just cover with water. 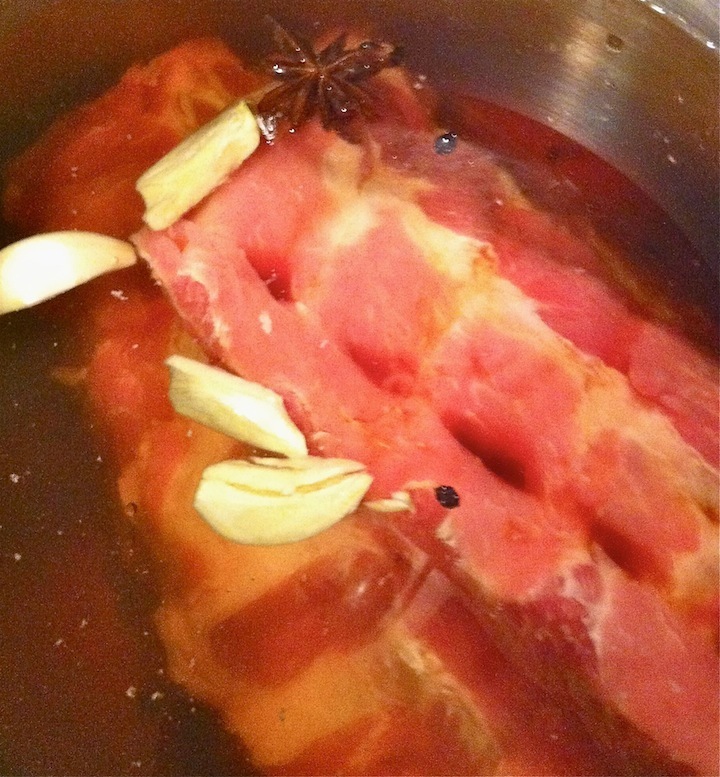 You are going to bring the water to a boil and then cover and reduce to a simmer for at least 45 minutes. This will tenderize the meat, and I like to think that some of the fat is removed too. I find that the smell is not appealing, so I add a little soy sauce to the water, and some aromatics like garlic, star anise, and black peppercorns. Honestly, I don't think this makes a bit of difference as far as the flavor of the meat, but it does make the house smell savory and spicy, instead of porky. You can put the boiled ribs in the fridge until you're ready to use them, or glaze them and put them in the oven immediately. Glaze...whatever you like works. I've been enjoying a Chinese-style glaze of Chinkiang vinegar, soy sauce, honey, and a bit of chili paste. You can do anything you like here for a glaze, though. I want to try a ponzu glaze, and some sort of BBQ sauce. I imagine that in a pinch, you could use BBQ sauce from a jar, although you would first have to shave your beard and take off your worn-looking wool cap. If you glaze and put in the oven right after simmering, as little as 20 minutes in a 325 oven is fine. But I've found that I get the texture I'm looking for after about an hour. 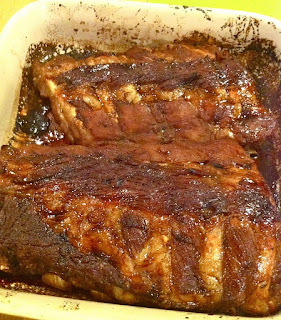 I take the ribs out of the oven and apply more glaze every 20 minutes or so. Ribs are rich and fatty. 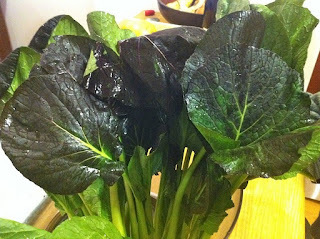 I like to serve mine with lots of greens, hopefully involving vinegar. This is not a new idea - this is the same idea behind cole slaw. Tatsoi is a healthy and very delicious green vegetable that does well cooked quickly in a wok. I did mine this time with a little Sherry vinegar and garlic. On this night, my kids and I rolled some vinegared sushi rice in nori and that completed our plates. 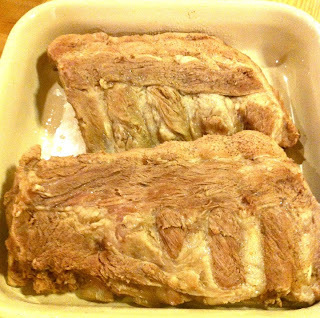 These ribs are delicious, and anyone who eats meat will love them. It's hard to describe the delight a parent feels when their young kids go to town on some protein, and that's exactly what happens every time I make this dish. Beer would be good, Riesling, Sherry, there are many nice options. 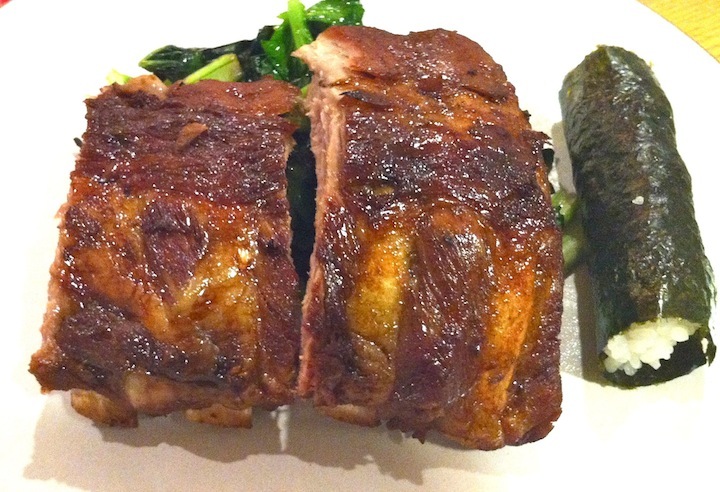 As crazy as it sounds, on this night I drank red wine with these ribs. 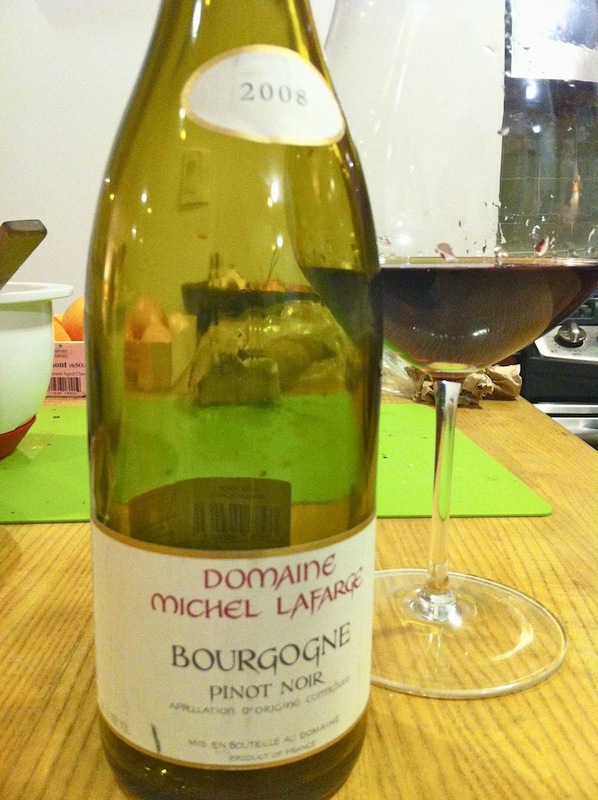 Michel Lafarge makes one of my favorite Bourgognes. It is a regional wine, but it is very serious stuff. It comes from vines that were formerly classified as Volnay villages, and the wine typically needs a few years to fully express itself. The 2008 is in a place now where the meatiness and richness of the fruit is strong, but so is the sense of stoney minerality. 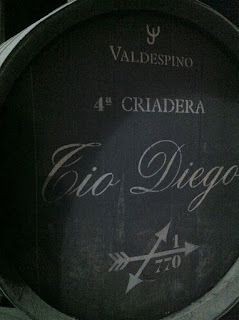 The structure is firm but the texture is velvet - this is such a lovely vintage for this wine. 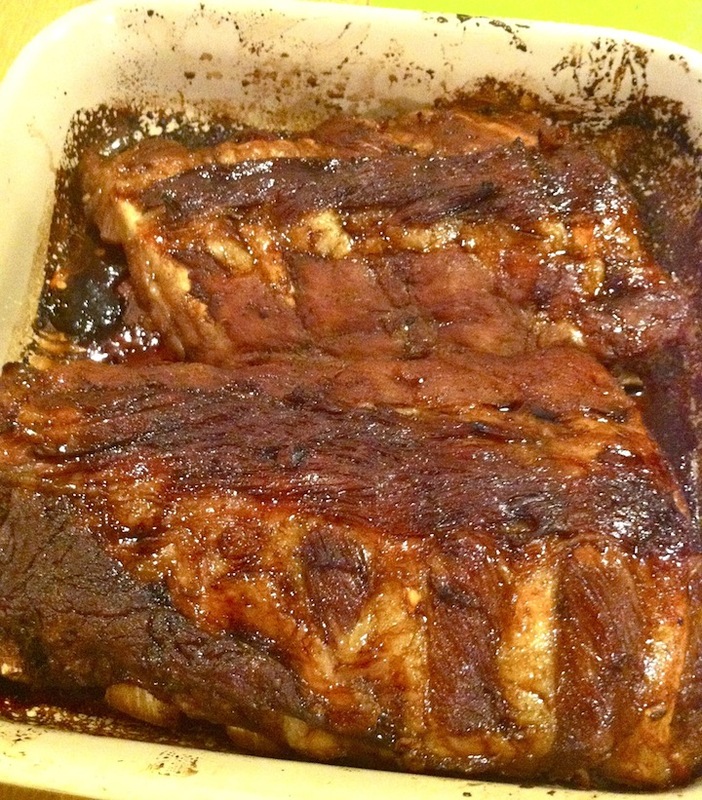 And it was great with the Chinkiang-glazed ribs. I thought it would be fun to do one more of these before the year ends. The other night, after picking up my kids and bringing them home to begin their week with me, I made a simple and quick dinner that we could eat together before bed time. Hamburgers, mashed potatoes, a few vegetables. I like to use ground turkey when I make hamburgers, but ground turkey that has plenty of dark meat in it, meat that stays juicy and rich. 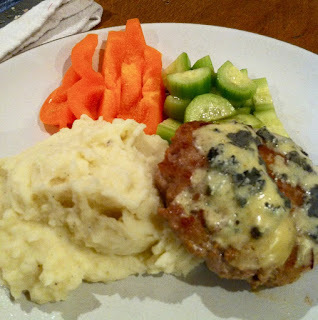 The daughters' burgers were topped with cheddar, mine with Jasper Hills Bayley Hazen blue cheese, my favorite blue cheese. Mashed potatoes were made with russets, butter, cream, and salt - that's it. Orange bell peppers and Persian cucumbers marinated in a bit of Sherry vinegar finished everyone's plate. This is one of those dinners that makes everyone happy - kids and grownups alike. What would you open with this meal? Leave your thoughts in the comments, and I'll leave a comment in a few days telling what I drank (and my younger daughter took a tiny sip of) with our dinner. I've been having a hard time with red wine lately. 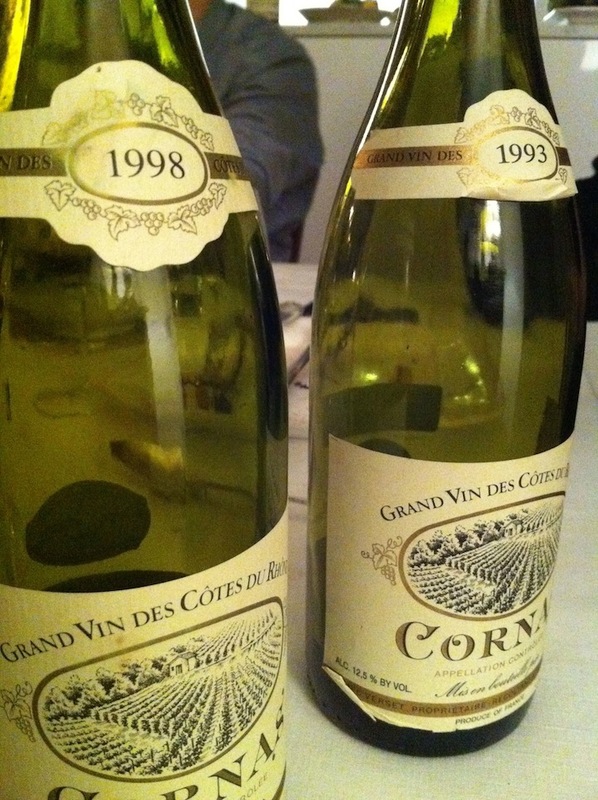 Okay, I never have a problem with mature Burgundy, or mature red wine in general. But when I'm alone and I feel like opening something to drink with dinner, or to just have a glass, I almost always reach for white wine these days. 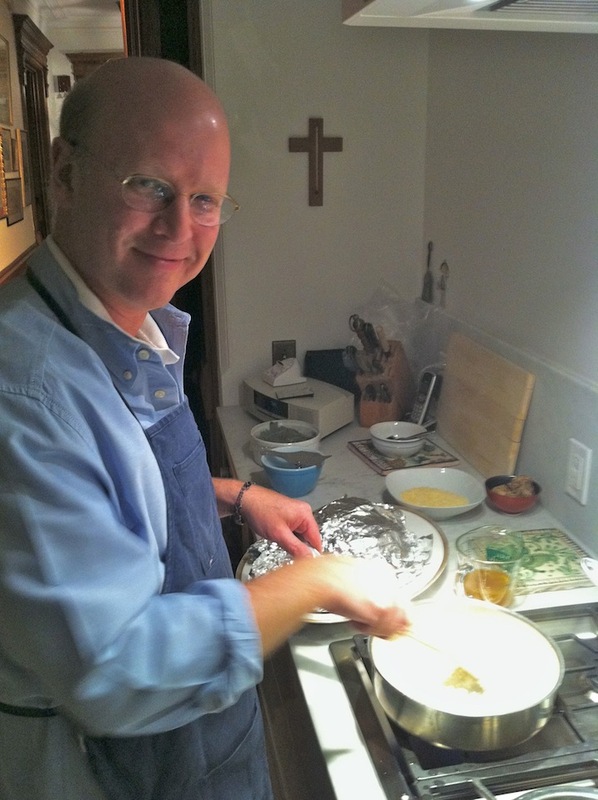 White wine is so much more versatile with food, so much easier to drink on its own. I'm speaking in broad terms, obviously, but I looked through what I've been drinking for the past few months and it's almost always white wine, unless some sort of special mature red is involved. There could be many reasons for my bias. 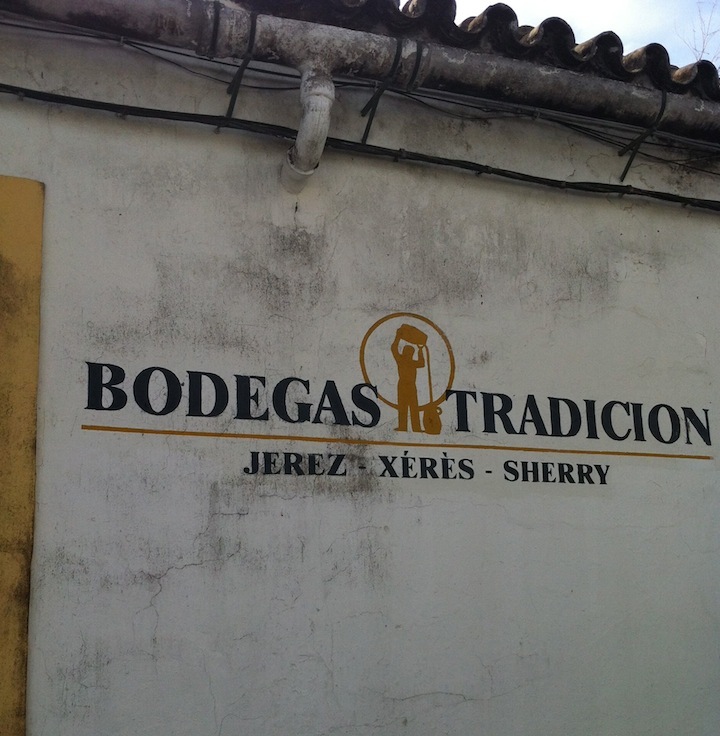 I did just go to Jerez, and I have been drinking a lot of Sherry. But I think it's more than that. 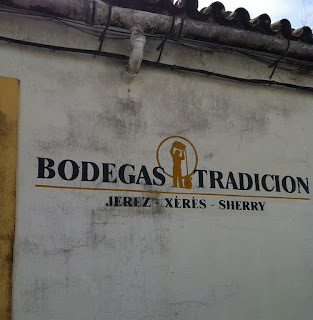 I think that it's about easy drinking - I want to drink wines that clearly say what they are about, where they are from, that do not distract me with excess fruit or tannin, or any kind of excess. Lately, white wine just makes this happen for me far more often than red. 2007 Muhr-van de Niepoort Carnuntum Blaufrankisch, $20, Imported by Martine's Wines. This is definitely a wine that showcases ripe dark fruit, but that's only a part of the package. There is an unmistakable white pepper scent (I guess white pepper is more about Austrian soils than it is about Gruner Veltliner), and the nose is entirely graceful and expressive. The wine is perfectly balanced and feels great in the mouth. 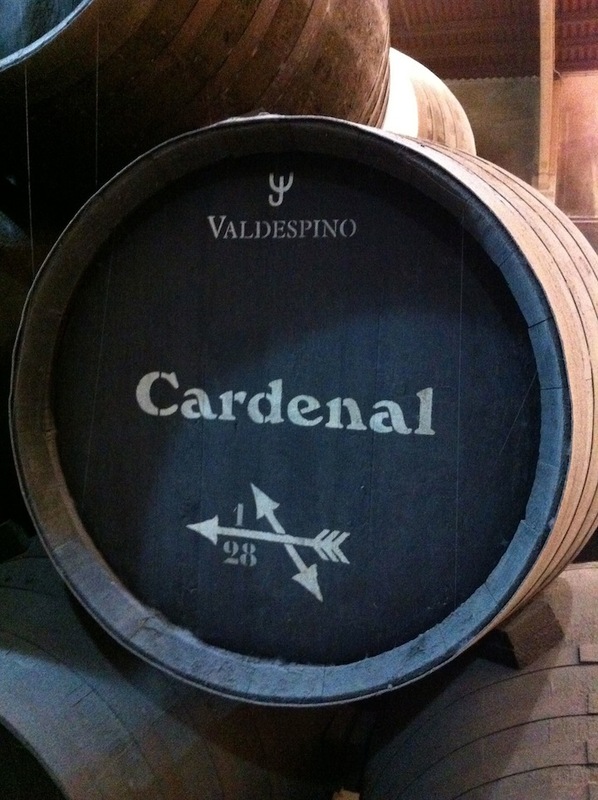 It satisfies on many levels - there is fruit, soil and mineral, and a pleasant leafy undertone. I must say, I've not been as impressed with a red wine in a while, as far as quality-to-price ratio goes. This is absolutely top notch wine, I bet it would improve with time in the cellar, and it sells for $20 before a mixed case discount. It isn't too hard to find in NYC (Blanc y Rouge in Brooklyn, Chambers Street Wines in Manhattan, among others), but if you're having trouble, try a wine by Moric - more expensive, but also great. 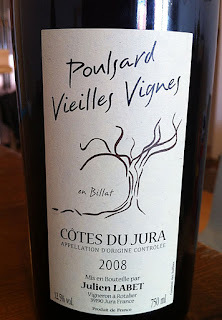 2008 Julien Labet Côtes du Jura, $36, Imported by Fruit of the Vines. Joe Salamone at Crush brings this wine to NYC and it's worth asking about. Objectively speaking, I think that Overnoy/Houillon's is the finest Poulsard out there, but that wine is basically impossible to find and it's gotten quite expensive. Labet's is excellent too. So light and graceful that it seems strange how well structured it is. 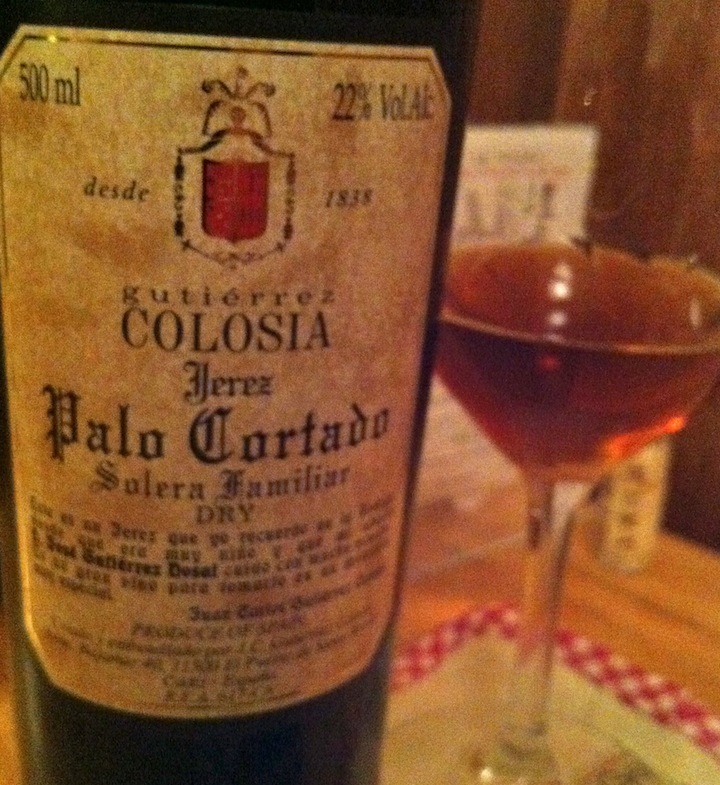 This wine smacks of dried leaves and blood oranges and herbs and it's completely delicious. But what moves me about it now is how impossibly weightless and light it is, and still how clearly and pungently it expresses itself. 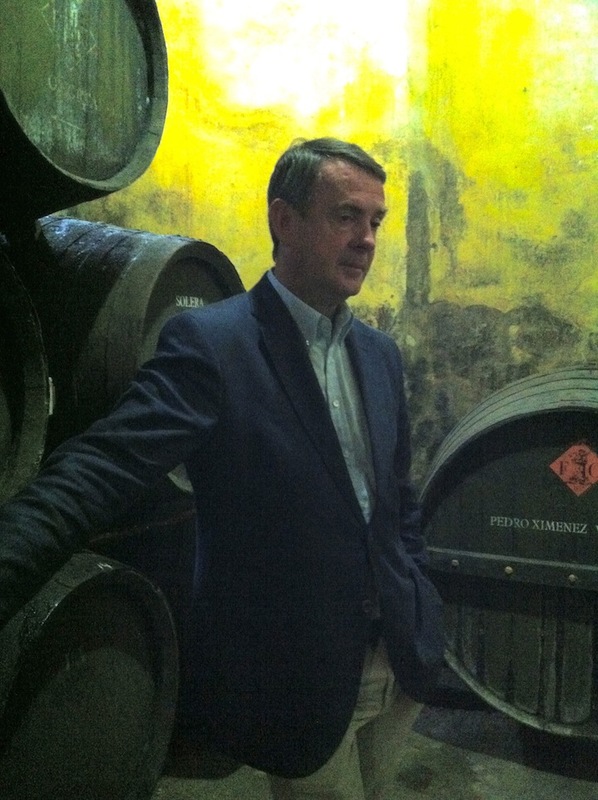 If Labet's Poulsard proves to be too hard to find, there are several others out there. They should all be similar in their graceful delivery of Jura-ness. 2010 Clos de Tue-Boeuf Cheverny, $19, Louis/Dressner Selections. 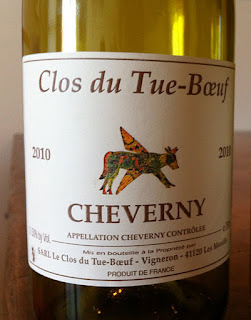 Red wines from Cheverny in the Loire Valley can include a variety of grapes. This one is made of Gamay and Pinot Noir. It is a lovely wine - high toned and bright red in fruit, a bit of forest underneath and a genuine crackle of energy that can be mistaken for effervescence - decant or otherwise aerate the wine and the energy is still there. This wine isn't for everyone - it's light and bright and flirts with volatility, and it doesn't offer anything in the way of power. It's not really about fruit either, although there most certainly is fruit. It's a refreshing and light wine that really is an expression of this place and this winemaker. 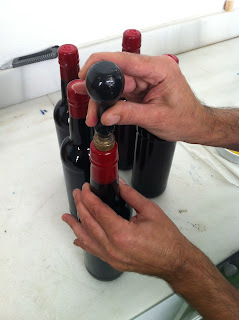 If you try it, aerate the wine before you drink it. 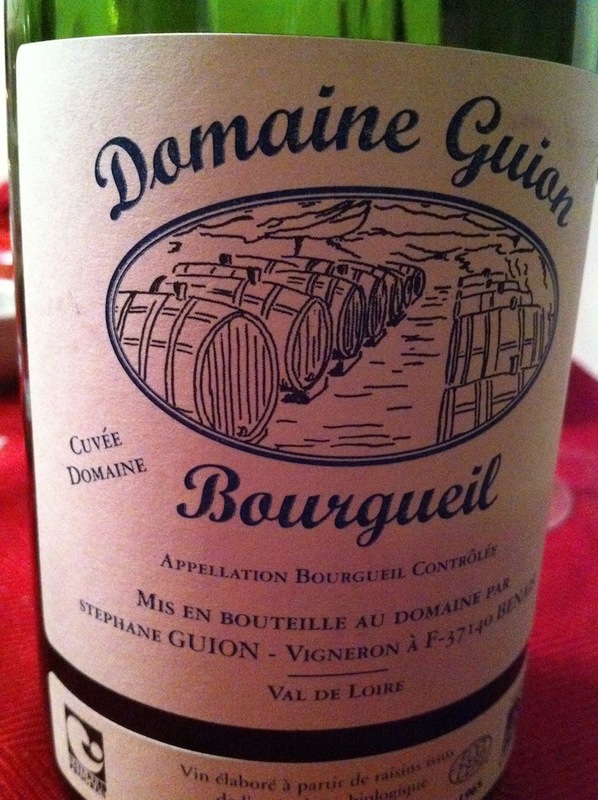 2010 Domaine Guion Bourgueil Cuvée Domaine, $12, Imported by Fruit of the Vines. David Lillie at Chambers Street Wines is responsible for bringing this wine to NYC. 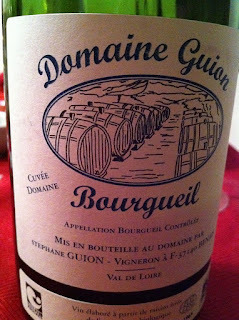 This is the lighter of the two Guion Bourgueils, and I prefer it to the Prestige Cuvée, in general. 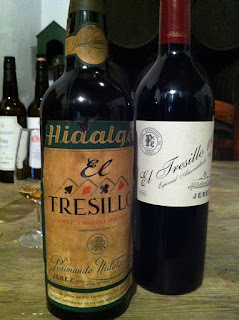 The 2010 is a wine that I really like, although again, it's not for everyone. It is not a fruity wine, except for the first 10 minutes or so after opening. It's only $12 but it is a complete wine - a perfect balance of iron minerals, bloody dark fruit, and acidity, and the structure is firm but doesn't intrude in any way. This is an easy drinking wine that I think faithfully expresses terroir. 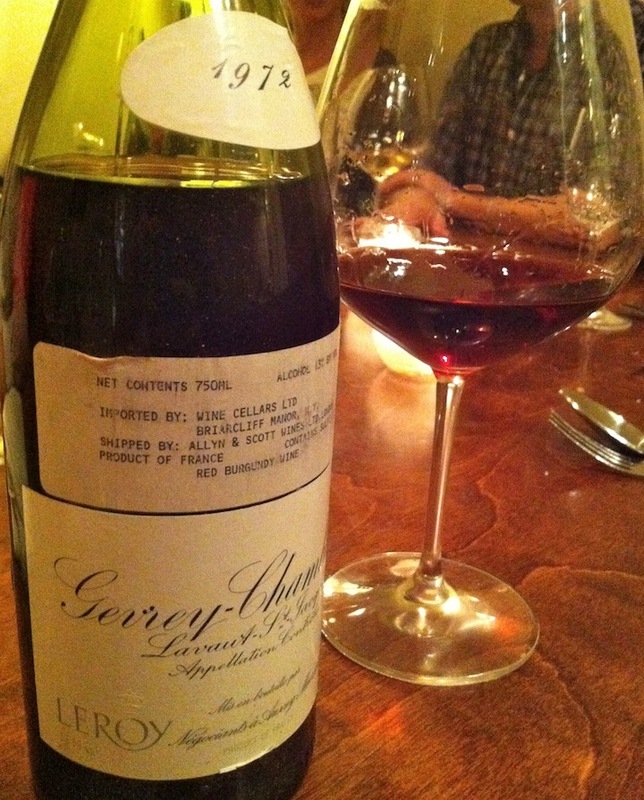 I had a birthday in November and a friend gave me a fantastic gift - Matt Kramer's "Making Sense of Burgundy." This book was published in 1990 and it continues to be on most shortlists of great wine books. I actually have read almost no wine books, so my entire list is a short list. But I must say, this book is wonderful. 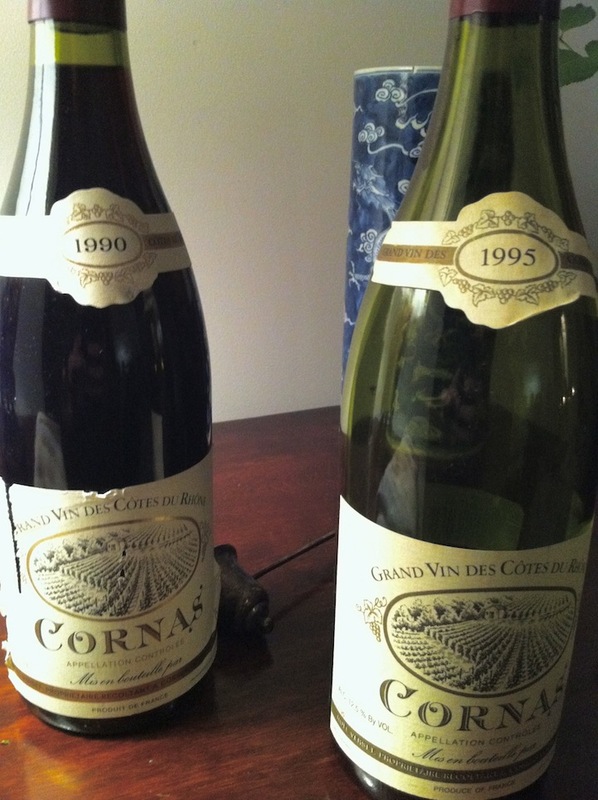 It offers plenty of fun for the obsessive among us, listing every owner of every Grand and 1er Cru vineyard in the Côte d'Or, as of the late '80s, anyway. There is apparently no other published source of this information. Kramer also describes in matter-of-fact prose the characteristics of these vineyards and the wines they are capable of producing. There are discussions of value in Burgundy and the relative achievements of individual producers (and it's fascinating to compare his predictions about rising stars with the producers today who are making waves). 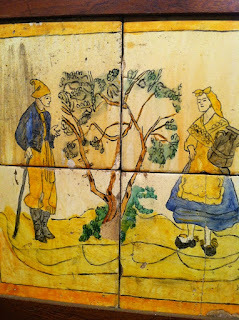 The section of the book that I find myself thinking abut the most, so far, is the chapter called "The Notion of Terroir." Kramer talks about all sorts of things here - you'll read about acupuncture, abstract expressionist painting, and the feudal ages in Europe, among other things. In this chapter are several passages that have really captured my attention and I find myself reading them over and over. 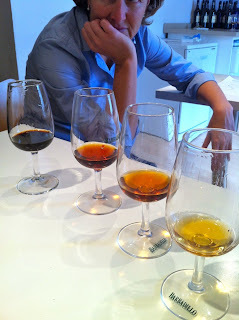 Kramer shares his thoughts on terroir, and it's as compelling as anything I've read on that rather wide subject. 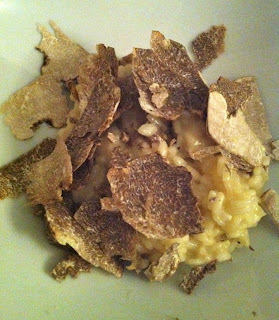 "Although it is derived from soil or land (terre), terroir is not just an investigation of soil and subsoil. It is everything that contributes to the distinction of a vineyard plot. As such, it also embraces 'microclimate': precipitation, air and water drainage, elevation, sunlight, and temperature. But terroir holds yet another dimension: It sanctions what cannot be measured, yet still located and savored. Terroir prospects for differences. In this it is at odds with science, which demand proof by replication rather than in shining uniqueness." 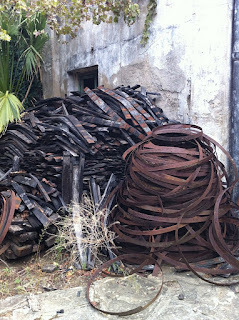 Hard to imagine a simpler and more effective notion of terroir, no? 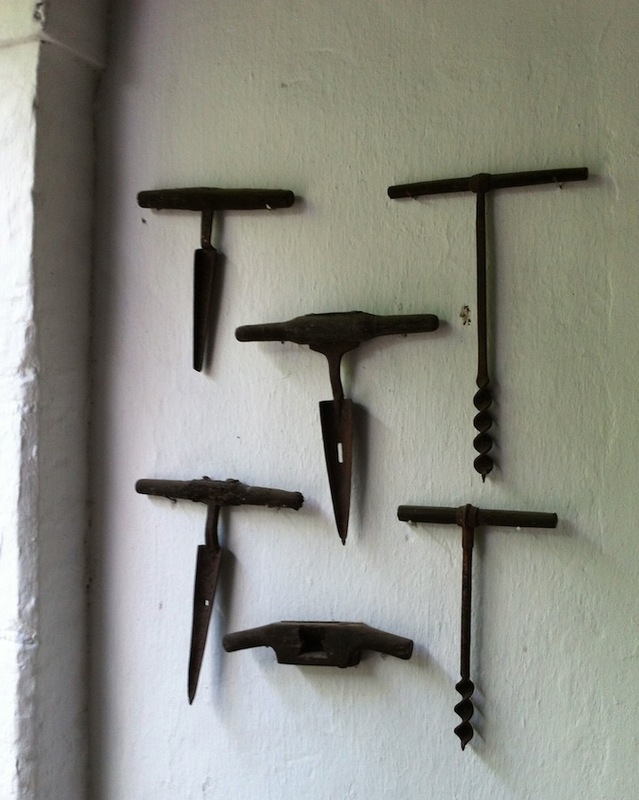 "The supreme concern of Burgundy is - or should be - making terroir manifest. 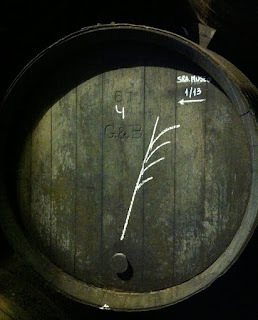 In outline, this is easily accomplished: small berried clones; low yields, selective sorting of the grapes; and, trickiest of all, fermenting and cellaring the wine in such a way as to allow the terroir to come through with no distracting stylistic flourishes. 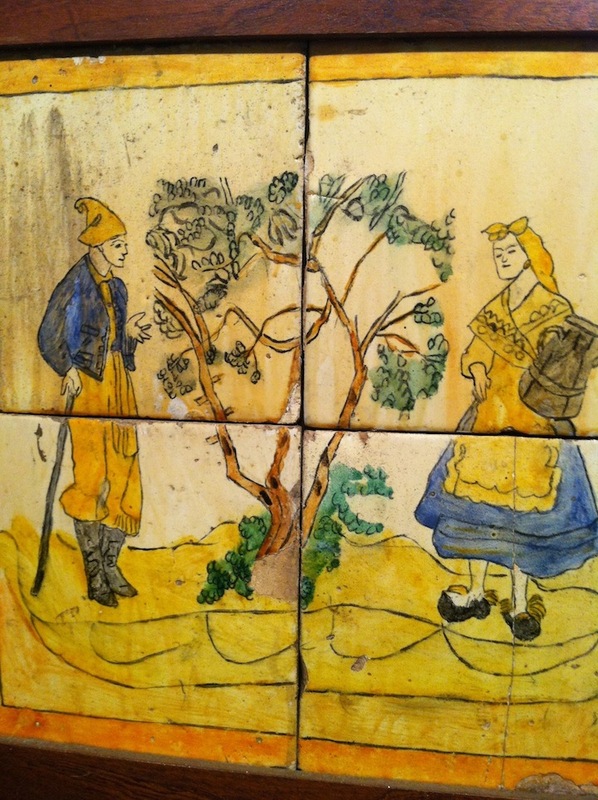 This is where terroir comes smack up against ego, the modern demand for self-expression at any cost, which, too often, has come at the expense of terroir." "The ideal is to amplify terroir without distorting it. Terroir should be transmitted as free as possible of extraneous elements of style or taste. 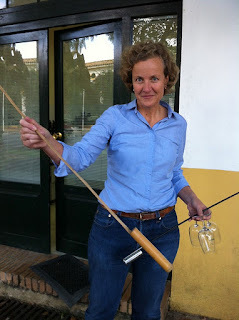 Ideally, one should not be able to find the hand of the wine-maker. 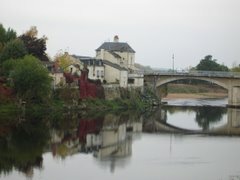 That said, it must be acknowledged that some signature always can be detected, although it can be very faint indeed when you reach the level of Robert Chevillon in Nuits-Saint-Georges; Bernard Serveau in Morey-Saint-Denis; or the marquis d'Angerville or Gérard Potel, both in Volnay, to name a few. 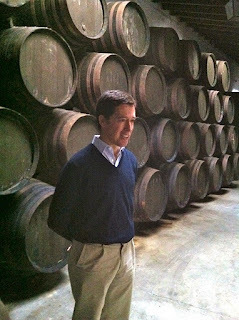 The self-effacement of these producers in their wines is very nearly Zen-like: their signature is an absence of signature." Fascinating ideas, I would say. So many things to think about in there. I wonder about some of the ideas in the final quote. Is it physically possible for there to be no signature? Wine is made, after all, and this handling of grapes leaves some trace behind. Or does it? And who is this Bernard Serveau, and I feel like a schmuck for never having tasted one of his wines. What do you think about when you read the above quotes? 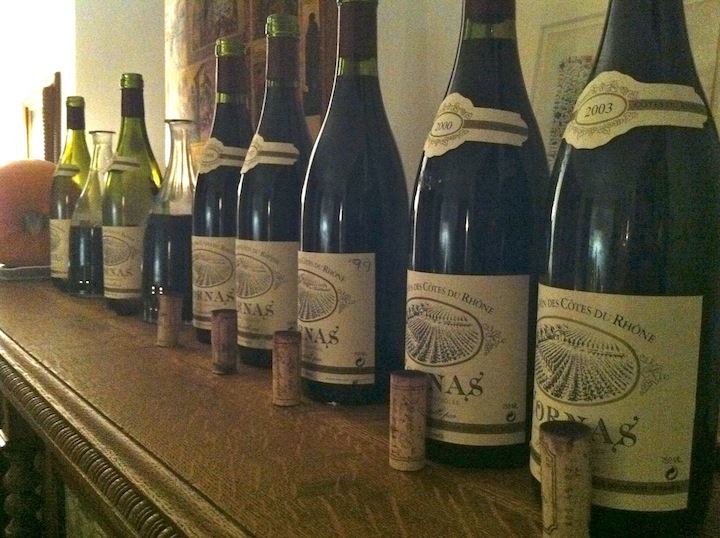 Were you as blown away as I am when you first read Making Sense of Burgundy? I think I should read some more about wine. So, what are some of your favorite wine books? Not novels, I mean. 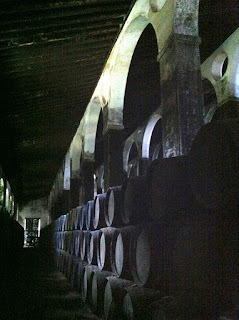 Reference books, books that offer this sort of illumination about a place or certain wines.